You can’t tell it from the picture, but every one of those critters is yelling for dinner. A few years ago, we bought a nice young female pig (also known as a gilt). Actually we bought two, with plans to breed one and visions of pork chops, bacon and such for the other one. 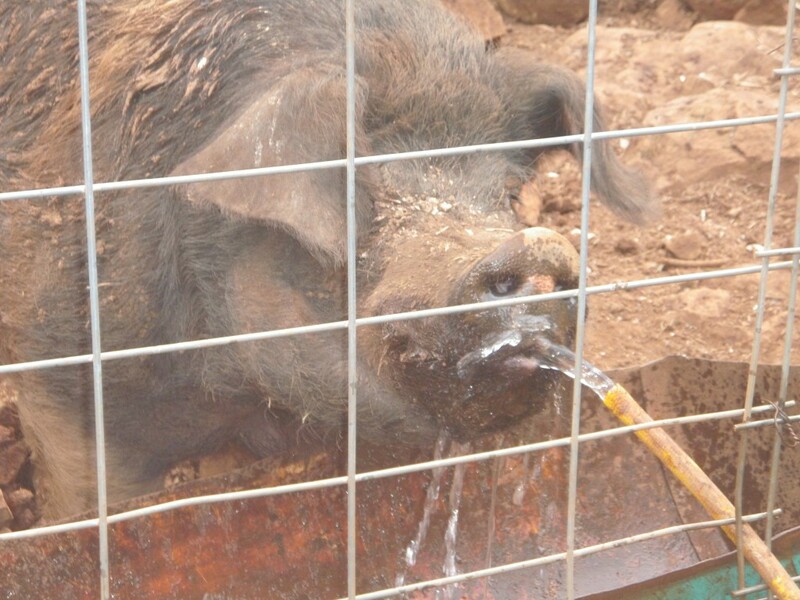 The second pig was duly butchered and placed in the freezer, while the first—a white Yorkshire the two youngest grandchildren named Pinky – enjoyed the life of luxury, rooting happily in her big pen, enjoying mud baths and the occasional shower from the hose, scarfing down pretty much every type of comestible we brought her (she did turn up her nose at citrus peels). 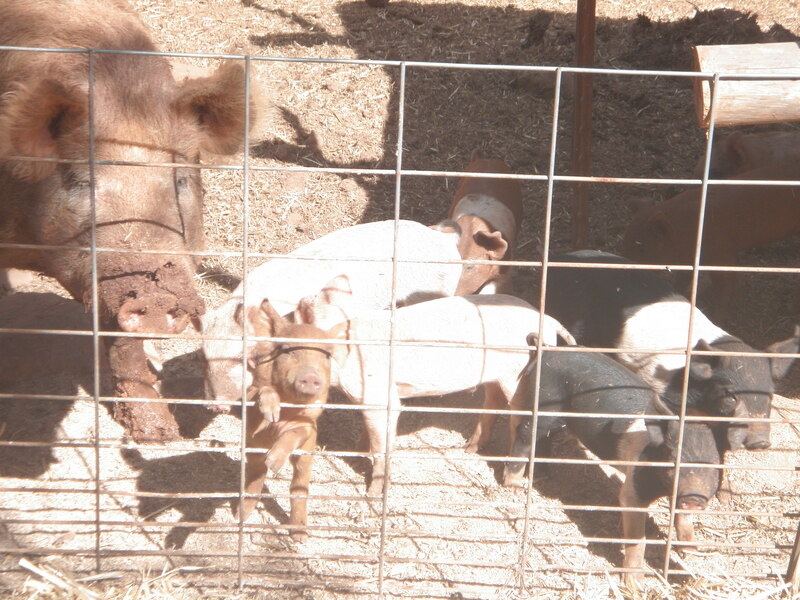 When she was about six months old, she acquired two male buddies; a pair of deep red weaner Duroc boars. Once again the plan was to use one boar for breeding and butcher the other. As pigs do, all three continued to grow nicely, and in the fullness of time, Pinky came into heat and was bred. 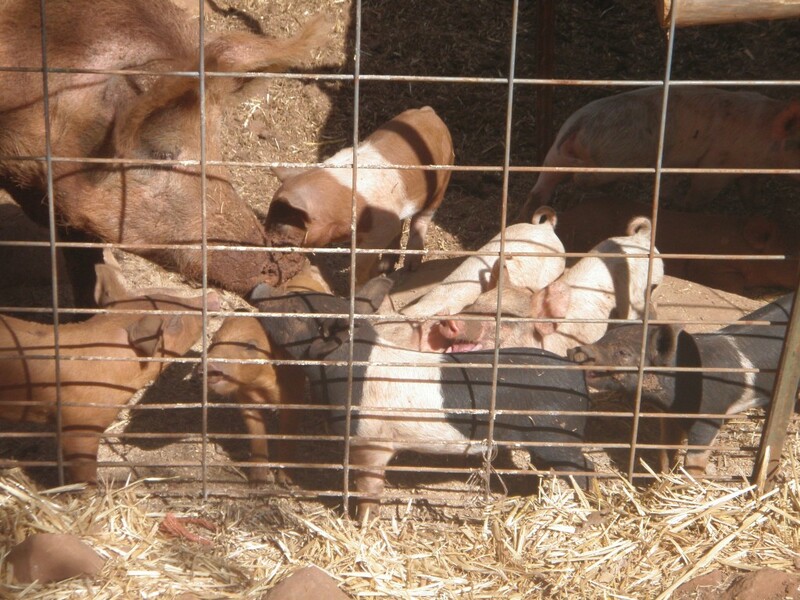 Since boars may hurt or kill piglets, that meant we needed to separate Mama from the boys. Baby pigs are just plain cute. Moving small pigs is relatively easy. If they’re small enough, you can pick them up and pack them to wherever you want them. Of course this is generally followed by a long hot shower and a thorough washing of the clothing you are wearing. 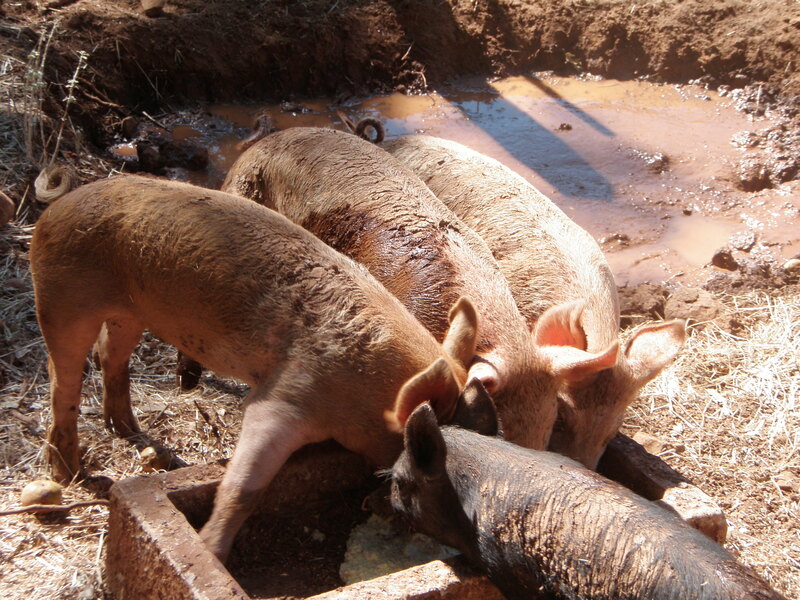 Even in the summer—especially in the summer—pigs will wallow in the mud, and they acquire a slight odor in the process. Larger pigs can be caught by one leg and dragged. Pinky, however, was now a fully grown 350 pound sow, which called for some other method. Yes, I know, we should have thought about that when she was younger, and trained her to walk docilely with us—hindsight, etc. Given that we had several hundred feet to travel, we decided the best option was to use the small trailer we pull behind the four-wheeler; it is sturdy, low to the ground, and has heavy metal mesh sides. It was too high to expect the pig to climb in, even with suitable inducements, so we backed it up to the pen and dug holes for the wheels, making the bed of the trailer nearly at ground level. Then we unwired a fence panel and added a couple of smaller panels to create a temporary chute with the “help” of the two boars, who were convinced we were playing with this stuff for their benefit. They chewed on the ends, shoved their snouts under the panels, tried to walk under them, and generally made a nuisance of themselves. Pinky, apparently suspecting something, kept her distance. Having chased the small children out of the area, we prepared to move the pig—which, by the way, was a new experience for me. We have raised pigs off and on but I have never tried to move one before. It’s an experience. Think really irritated sumo wrestler. With teeth. First there were several trips around the big pen, with Pinky expressing her disdain by burrowing under bushes and galloping gaily away from my cursing husband. The two boars were happy to get in the makeshift chute, especially after I tossed a few bread crusts in as bait. Pinky remained aloof. Pig water fountain. Can’t leave the hose there, though, as he’ll pull it into the pen to play with. Finally we managed to get all three in the corner, eased the boys out while Pinky was sniffing at the remnants of crumbs they had left, and pointed her at the trailer. She walked up, stood contemplatively sniffing the floorboards, and eyed the crusts placed there for bait. Then she made a sharp right turn and zipped out of the chute and into the open, followed by my cursing husband. My daughter and I followed, providing moral support and cutting horse moves to help herd the pig. Since she showed no inclination to get back in the pen and began to travel down the road in the direction we wanted her to go, the plan was rapidly revised (on the hoof, so to speak). We would walk her to the new pen. This went well for about two hundred feet, until Pinky came snout to trailer hitch with the big wood chipper, which was parked near the entrance to the pen. Pigs don’t have eyes like a hawk, they tend to near-sightedness. Not only was she not close enough to see what that big white monster was, she had never seen anything like it. Pinky followed the ancient dictum: if you think it might eat you, run! She was, of course, followed by my cursing husband. After several circuits and a couple of trips up the roadbank, our son-in-law and the new ranch hand happened to come along at an opportune moment. At that point I suggested they try to take her back to the pen—which was where she was trying to go anyway—and start over with the trailer idea. Glares from the men; the pig would go where they wanted her to. Three little pigs in a row and one outlier. More people did not help much; there was much crashing of brush and continued cursing. Inspiration or sheer frustration struck my husband, who yelled for rope. The rope was duly brought, and the men set about tying a harness on the now thoroughly grumpy pig. Since pigs have big shoulders and small heads, you do not leash them—you tie a rope around the middle, just behind the front legs. In Pinky’s case it was then necessary to bring a loop between the front legs and back over her shoulders. Having secured her, they began to move the pig, who was now adding her own porcine curses to the general mayhem by grunting, squealing and barking at the top of her voice. Since my husband was still cursing, and the other men also yelling, while my daughter added her own noise when the pig bit her, God knows what the neighbors thought we were doing. Having knocked my husband down—he did stop cussing for a few minutes as it knocked the wind out of him—and slammed our son-in-law against a large oak tree, the pig finally decided that while the big white mechanical monster might eat her, these humans were definitely going to kill her. She headed for the new pen and once in, promptly set about making herself a new wallow to cool off. The men, led by my cursing husband, headed to the house for ice packs and ibuprofen. This entry was posted in Farms, Food and tagged moving pigs, pig, Pinky, sow. Bookmark the permalink. Just curious, are sows like mares, meaning that if you lead the baby away, mama will follow? Depends on the sow, Dennis. 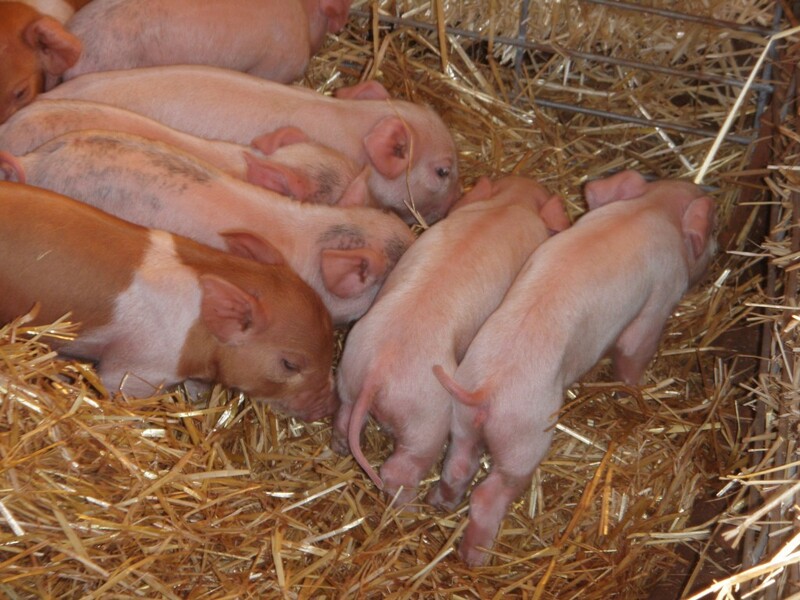 Pigs usually have more than one baby (Pink’s first litter was 13), so it’s kind of hard to take just one baby. However, the piglet generally squeals bloody murder, and that brings Mama rushing to investigate. Sometimes it also brings Mama rushing to bite you on the leg or try to knock you down. Luckily, Pinky turned out to be a pretty mellow gal, so she will hurry over to check, but has never offered to bite. Some sows are so nasty-tempered, especially right after they farrow, that you touch their babies at the risk of losing your hand!